If you want longer or bigger hair, there isn’t a magic pill to take. You have to focus on keeping the hair already on your head healthy. 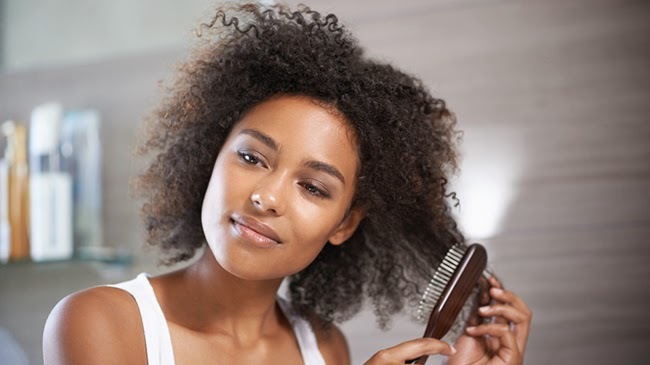 There’s not much you can do to force your scalp to grow hair faster, but you can focus on hair care habits that prevent breakage. Here are three important things to do to handle your coils with care. Remember when your head would jerk in the direction your mom ferociously brushed it? Don’t relive those tortuous moments! Since our natural hair coils and springs back into place when we let it go, it’s even more important to hold the section of hair we’re detangling. You want to detangle your hair from ends to root, so hold your fingers a few inches above the ends, detangle, and then move up a few more inches until you’ve reached the root. Maintaining healthy natural hair is all about moisture. It’s easy for our coils to snag on rough fabrics, so switching to a softer textile like satin or silk will prevent your hair from snagging. I’m not a huge fan of protective styling. I figured since I grew this hair I need to wear it out whenever possible. But protective styling is a great technique to prevent breakage. The more we tousle our hair around, the more opportunities we have for tangles and breakage. Try to fight Hand In Hair Syndrome and opt for twists, braids, buns, etc. How do you prevent breakage with your natural hair? Posted on July 21, 2015, in Natural Hair and tagged comb, natural hair breakage, natural hair prevention, natural hair tips, protective styles, satin, silk, styling tools. Bookmark the permalink. Leave a comment.